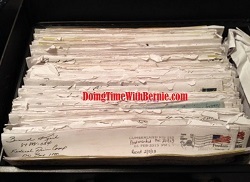 DoingTimeWithBernie.com: Is Felon Bernard Kerik planning a bloody revenge on his former friends? Is Felon Bernard Kerik planning a bloody revenge on his former friends? Felon on US Federal Release (probation), Bernard Kerik, has recently been on a disturbing trend of posting Instagram pictures of weapons. Is this alleged pathetic psychopathic character sending society and his former friends a message? Felons on probation, at least those that are "supervised" are usually prohibited from owning, possessing or being in the vicinity of deadly weapons, including guns. Twice in the last two weeks, Kerik has posted (on his personal and open Instagram account), himself in possession of or in the close vicinity of a prohibited weapons. However, when a felon on probation has the US Department of Probation, Franklin Lakes Police Department and the New Jersey State Police in his pocket, anything is possible. Days ago. felon on probation Kerik posed near weapons when apparently invited to an police training by his son, Newark Police Officer, Joe Kerik. Newark Police did not return calls for comment. It is probably an understatement to say Bernard Kerik is presently not too happy with several ex-friends. In fact, two of Kerik's former friends currently have civil cases against the felon. After Kerik's counterclaims were tossed out of court, Joe Tacopina is moving onto a jury trial in his $5million dollar defamation suit against Kerik (Tacopina v. Kerik 1:2014-cv-00749) who, with the assist of Kerik's unscrupulous Attorney Timothy Payne Parlatore of FisherBroyles LLP, who wildly and irresponsibly defamed Tacopina in print media. Also pending in the Southern District of New York is Kerik's "From Jailer to Jailed" co-author, Dara D'Addio, (DAddio v Kerik 1:2015-cv-05497 S.D.N.Y) who is suing for her copyright and fees for the book Kerik published allegedly using her work they wrote over three years of Kerik's imprisonment then published and profiting without her permission. We have documented in this blog the abuse she and her family have suffered to date. Ms. D'Addio, who Kerik threatened in 2013 to "destroy her life", expressed she remains frightened, disturbed and "deeply concerned" by the gun/knife photos/threats by Bernard Kerik, Joe Kerik and his other seedy associates, but, to date, no law enforcement agency including US Department of Probation SDNY and the Franklin Lakes Police Department have taken her reports seriously. And then there's recently arrest of Bernie Kerik's pal, Frank DiTommaso, who is charged with a recent beating Kerik's FBI informant and ex-pal, Larry Ray. This is a long-standing Kerik beef which dates back to Kerik's arrest and imprisonment. (USA v Kerik 7:2007-cr-01027 S.D.N.Y). Read the emails from back in the day when Bernie Kerik told Larry Ray "I Love You".... Were these two more than just friends?